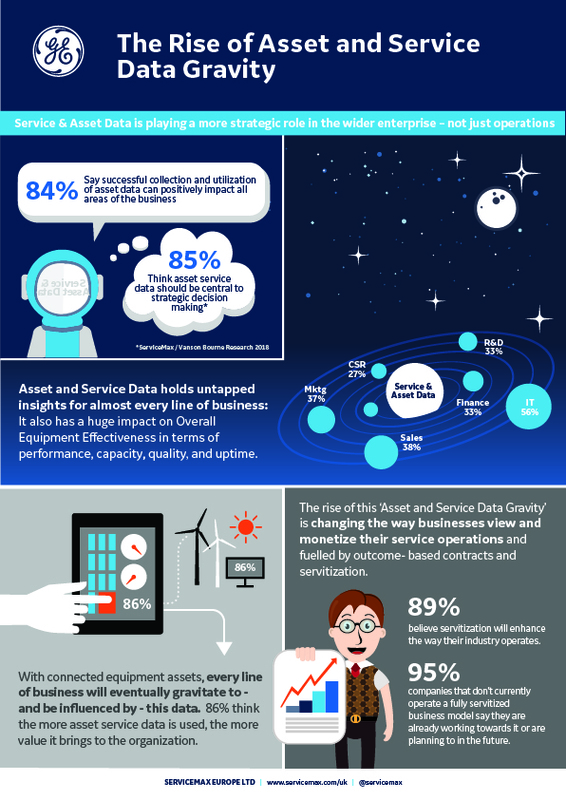 19 June 2018 – London, UK - Asset and Service Data are having a gravitational pull beyond service departments due to breadth and depth of product and customer information, according to new global research, “The Rise of Asset and Service Data Gravity”, conducted by Vanson Bourne on behalf of ServiceMax from GE Digital. With digitization, service data is a subset of the asset data, and both hold untapped insights for almost every line of business – from sales, R&D, IT, finance, marketing and Corporate Social Responsibility. The rise of this ‘asset and service data gravity’ is changing the way businesses view and monetize their service operations. GE Digital is reimagining how industrials build, operate and service their assets, unlocking machine data to turn valuable insights into powerful business outcomes. GE Digital’s Predix portfolio – including the leading Asset Performance Management and Field Service Management applications – helps its customers manage the entire asset lifecycle. Underpinned by Predix, the leading application development platform for the Industrial Internet, GE Digital enables industrial businesses to operate faster, smarter and more efficiently. For more information, visit www.ge.com/digital. This press release was distributed by ResponseSource Press Release Wire on behalf of Devonshire Marketing in the following categories: Business & Finance, Manufacturing, Engineering & Energy, Computing & Telecoms, for more information visit https://pressreleasewire.responsesource.com/about. Devonshire Marketing is a UK PR agency specialising in the B2B IT arena.